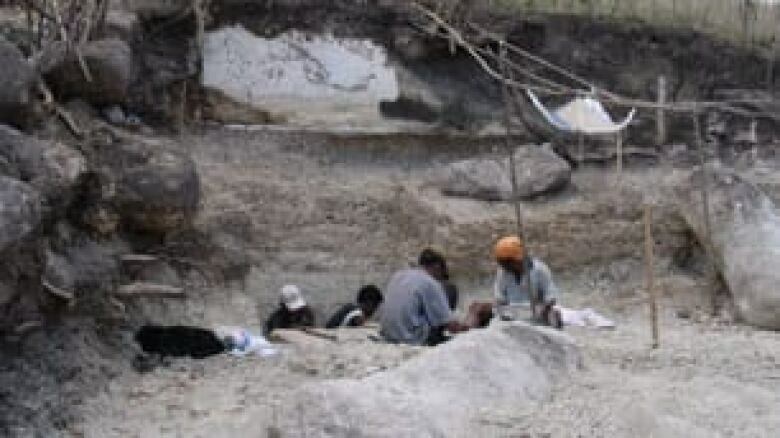 A new batch of stone tools suggest the ancestors of the hobbit-like species of humans colonized the Indonesian island of Flores much earlier than previously thought, say researchers. The tools were found in excavations at Wolo Sege on the Indonesian island of Flores, in September 2005. ((Adam Brumm))Mike Morwood and Adam Brumm of the University of Wollongong in Australia and colleagues reported their study of the tools this week in the journal Nature. "We're pushing back the antiquity of hominins on Flores," said Morwood. Now in joint Indonesian-Australian research with the Geological Survey Institute of Bandung, Morwood, Brumm and colleagues have dated tools around a million years old, pushing the date that humans colonized Flores back by 120,000 years. The tools came from a new site in the Soa basin, to the east of Liang Bua cave, where the 18,000-year-old species Homo floresiensis, dubbed the "hobbit" for its small size, was found. The tools, which could only have been made by early humans, were in the bottom sediment layers of the site, just above the bedrock. Brumm says while the findings are "exciting," they are also "frustrating." The fact these tools are on the bedrock at these sites means any evidence of even earlier human occupation of Flores would not be found there. "The search is on to try and find other sedimentary basins on Flores that may well have a geological record spanning one to two million years ago," said Brumm. But subsequent anatomical evidence suggested the hobbit was instead descended from an even more primitive and smaller creature, such as Homo habilis, said Morwood. The presence of such a primitive creature in this part of the globe challenges the generally accepted idea that anatomically modern humans originated in Africa as early as 200,000 years ago — the "out of Africa" theory — and suggests important human evolution may have happened in Asia. But the researchers hope the stone tool evidence may provide circumstantial evidence to support this theory by providing evidence of human colonization before Homo erectus was around. "We're starting a major project this year — a five-year project — and we hope to push back the dates much much further," says Morwood. "We need dates of 1.5 [million] or 1.8 [million years ago] or more to say this is definitely not [Homo] erectus we're talking about." Brumm said the discovery of evidence for early humans one million years ago also suggests that they may have not hunted pygmy stegadon and giant tortoises to extinction as previously thought. "So it appeared that at around 880,000 years ago, hominids suddenly arrived on Flores and very rapidly wiped out these pygmy stegodon and giant tortoise, both of which would have been quite easy to hunt," said Brumm. But the most recent discovery of tools suggests that humans co-existed with these animals, said Brumm, and they died out due to other causes.